Amos Reed was sleeping on a bench in downtown Santa Barbara and living in a friend’s car last summer when he walked into a toy business on State Street. He came out with something unexpected — a job — an often elusive prospect for those living on the streets. The 23-year-old now earns enough money at Game Seeker to rent a shared room on Santa Barbara's Westside. And ever since, he's returned for daily shifts at the store to help customers, work in sales, unpack items, take out the trash and more. “See that bench over there?” Reed said, while pointing to Cost Plus World Market on the State and Cota streets intersection. 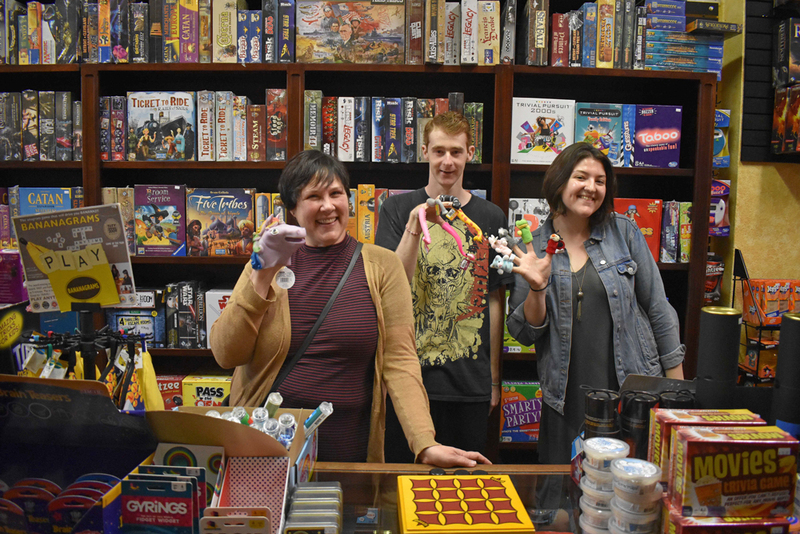 You can sense the Santa Barbara native’s interest for games as he describes Dungeons and Dragons inside Game Seeker, which is at 537 State St.
“I love this job, and I love board games,” Reed said. Emily Gerr, the lead sales associate at Game Seeker, said Reed would come into the store and hang out, and eventually asked her mom, business owner Lisa Gerr, if she needed help around the store. She described one of Reed’s first shifts on the sales floor, when he was helping a customer from San Luis Obispo who was seeking games to help with memory loss. Reed is punctual and reliable, Emily Gerr said. “He’s an incredible employee, and knowledgeable. He will never let us down,” she said. When business slowed down in December and January due to the Thomas Fire and Jan. 9 debris flow, Lisa Gerr said she sought additional work as a marketing consultant so her employees — including Reed — could keep their hours. “Regardless of what was happening…I went to look for a job, and I didn’t want my employees to lose theirs,” she said. Lisa Gerr’s face lit up as he spoke. Reed said he was raised by a single mother, who was also living on the streets at one point and now resides at the New Faulding Hotel. He has had other jobs before — he previously worked as a gardener and lost his hours — but there's clearly something special about this one. Reed said getting his high school diploma and traveling to Japan are now on his to-do list. “I want to go back to school, but I have to finish my high school diploma,” he said, adding that he had dropped out of San Marcos High School. He is currently enrolled at Santa Barbara City College’s Schott Campus.